12 Comments on Public Service Announcement: Stay Safe! Honey’s Halloween-style costume might suggest that she has no medical training — but hey, she did talk about having gone to First Aid Camp! Oh no Honey, you’ve been spotted!! Quick, hide in a box. I think this is a callback to the “Electrical Safety” comic. Which is very interesting. I know the author stated that something had developed in the last few comics, but I couldn’t see it. But maybe this new dream (I’m presuming this is another “safety dream”) of Honey Heart’s will clarify what it is that has changed about her. Novelty Nurse Hart looks discouragingly natural in her outfit… but this is only a minor observation smothered by the more pressing thought of “I want that hanged-man top”. p.s. please tell me one of those costume bin nurse outfits is a frank’n’furter smock for Arsenic. Honey, don’t lie! We know you like her sassy and reckless! Also Terps is always stilling her drinks when she sees honey! They’re straight up cold *flirting* now. The subtext is very rapidly about to become text. Aww, Turps’s so cute when she blushes. Although on my next reread I think I might keep a tally of how many drinks she’s dropped. She’s kind of got a problem with that. Also, that Kitty Committee sticker is rad and I really hope it ends up in a future sticker pack. I second the sticker idea. No one passes up the opportunity to decorate the instruments of their entire band with phrases from an obscure yet brilliant webcomic. Or maybe that’ll just be me. Heh. KITTY COMMITTEE as some kind of possible real life sticker: idea noted! Also: it’s one of my very favorite things ever when I see my stickers on real people’s musical instruments. Happy jellyfish is my new favorite <3 please make him a thing! 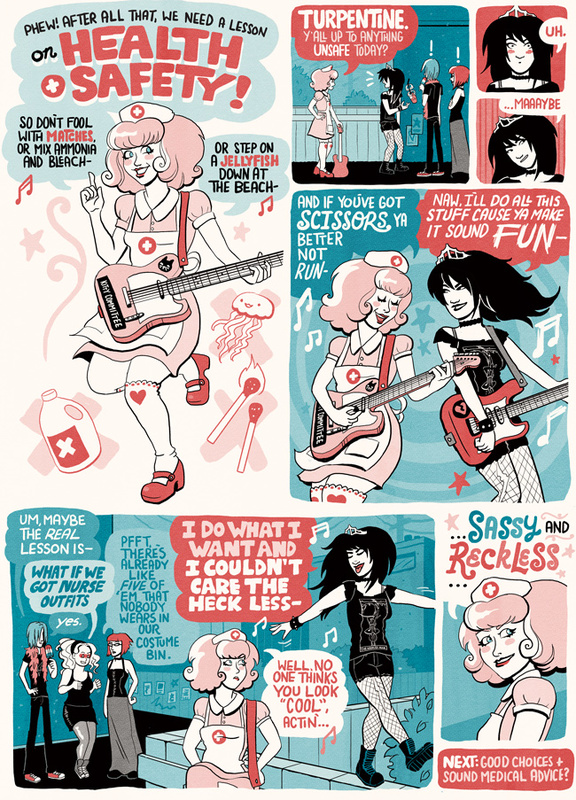 Honey's lookin' pretty badass in the last panel. FOR THE LOVE OF ALLL THAT IS HOLY ON THIS EARTH KISS!!! !